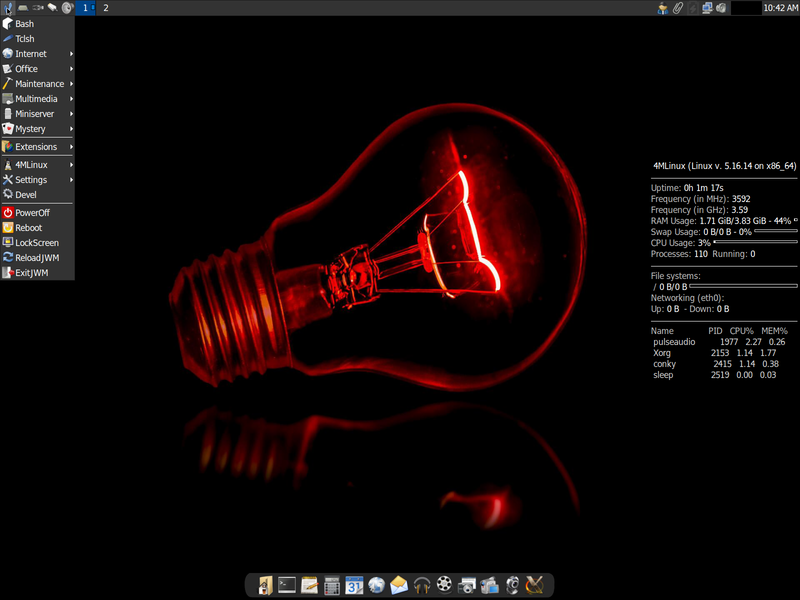 Kore Linux was a Korean Linux distribution based on Fedora Core. Rate this project 4MLinux 27.0 has been released. 4MLinux is a project building a set of Linux distributions for desktops (with JWM, 32-bit only) and servers (with the complete LAMP stack, 64-bit). The new version comes with assorted improvements on the multimedia and gaming fronts: "The status of the 4MLinux 27.0 series has been changed to STABLE. As always, the new major release has some new features: optional support for AV1 video coding (encoding via FFmpeg and decoding via VLC and mpv), an option to disable PulseAudio with one click (important for those who use 4MLinux to play classic video games such as DOOM), better support for display drivers when 4MLinux is running in KVM (important for those who use a VNC client to manage 4MServer). LazPaint (small yet powerfull raster image editor with layers) and Blender (professional 3D computer graphics software) have been added as downloadable extensions. Additionally, some good news for gamers: more engines available for XBoard (GNU Chess, GNU Shogi, Fairy-Max) as well as more video games to play (Duke3D, Liero, Strifle). A few small terminal-based games have been added, too." Here is the brief release announcement. Download (MD5, pkglist): 4MLinux-27.0-32bit.iso (1,136MB), 4MServer-27.0-64bit.iso (1,207MB). 4MLinux is a miniature, 32-bit Linux distribution focusing on four capabilities: maintenance (as a system rescue live CD), multimedia (for playing video DVDs and other multimedia files), miniserver (using the inetd daemon), and mystery (providing several small Linux games). The distribution includes support for booting on UEFI-enabled machines. A new version of 4MLinux, an independently-developed distribution for desktops (JWM, 32-bit) and servers (complete LAMP stack, 64-bit), has been released. Version 28.0 ships with Linux kernel 4.19.19, updated desktop and server packages (LibreOffice 6.2.1, GIMP 2.10.8, DropBox 66.4.84, Firefox 65, Chromium 72, MESA 18.2.0, Apache 2.4.38, MariaDB 10.3.12, PHP 5.6.40 and PHP 7.2.15), as well as improved installation script: "The status of the 4MLinux 28.0 series has been changed to 'stable'. As always, the new major release has some new features: improved installation script (new disk formatting options have been added); much more firmware available (for network devices, sound cards and scanners); added support for reading bar codes (via ZBar), better support for Debian and Fedora packages (via Midnight Commander and Engrampa), new web browser (NetSurf) as well as new download manager (Gwget). Additionally, Electrum is now available as a downloadable extension (both Bitcoin and Litecoin wallets are supported by 4MLinux)." Read the full release announcement as published on the project's Blogspot page. Download (MD5, pkglist): 4MLinux-28.0-32bit.iso (1,181MB), 4MServer-28.0-64bit.iso (1,238MB). Version 26.0 of 4MLinux, a minimalist distribution for desktops (with JWM) and servers (with the complete LAMP stack), has been released. The project's latest stable build comes with upgraded packages as well as support for modern image and video encoding: "The status of the 4MLinux 26.0 series has been changed to stable. Edit your documents with LibreOffice 6.1.0 and GNOME Office (AbiWord 3.0.2, GIMP 2.10.6, Gnumeric 1.12.43), share your files using DropBox 55.4.171, surf the Internet with Firefox 61.0.2 and Chromium 68.0.3440.75, stay in touch with your friends via Thunderbird 52.9.1 and Skype for Web, enjoy your music collection with Audacious 3.10, watch your favorite videos with VLC 3.0.3 and mpv 0.28.2, play games powered by Mesa 17.3.7 and Wine 3.14. You can also setup the 4MLinux LAMP Server (Linux 4.14.64, Apache 2.4.34, MariaDB 10.3.9, PHP 5.6.37 and PHP 7.2.9). Perl 5.26.1, Python 2.7.14 and Python 3.6.4 are also available. 4MLinux 26.0 comes with some new features: Tcl/Tk (with a collection of small games) has been integrated into 4MLinux, Engrampa (archive manager) is finally able to open Debian packages, Git in 4MLinux has now both GUI and cgit web interface...." Continue to the release announcement for more details. Download (MD5) (pkglist): 4MLinux-26.0-32bit.iso (1,184MB), 4MServer-26.0-64bit.iso (1,253MB). 4MLinux is a small, 32-bit Linux distribution focusing on four capabilities: maintenance (as a system rescue live CD), multimedia (for playing video DVDs and other multimedia files), miniserver (using the inetd daemon), and mystery (providing several small Linux games). The project's latest release, 4MLinux 25.0, smooths out handling CA certificates, offers an option to disable the login screen and uses mpv as the default media player. The release announcement reads: "As always, a new major release comes with some new features: better handling of CA certificates (no need to accept them manually), full support for Zstandard data compression algorithm (4MLinux Backup Scripts), login screen can now be disabled (it's a response to user requests), GIMP 2.10 with full support for scanners and digital cameras, Python3 with Meson and Ninja (this is now, de facto, the main build system in GNOME/GTK+ ecosystem). The default media player in 4MLinux is now mpv (with GNOME MPV). Other players (MPlayer, SMPlayer, Xine and VLC) are available as downloadable extensions. Good news for modern computers: all these applications are now able to make use of hardware video acceleration (via VA-API and VDPAU). Good news for old computers: MPlayer, Xine and VLC can play videos without X Window System (use Midnight Commander to select files to play)." Download (MD5) (pkglist): 4MLinux-25.0-32bit.iso (1,162MB), 4MServer-25.0-64bit.iso (1,259MB). 4MLinux is a lightweight Linux distribution focusing on such capabilities as maintenance (as a system rescue live CD), multimedia (for playing video DVDs and other multimedia files), and miniserver (using the inetd daemon). 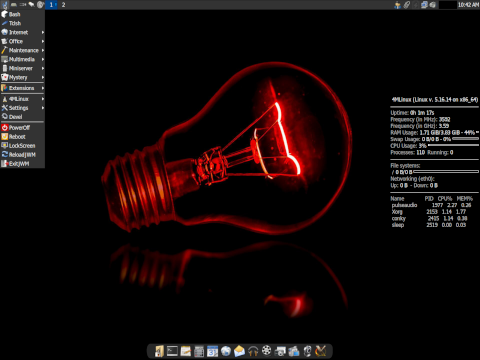 The project's latest release is 4MLinux 24.0 which is available in desktop and server editions. The status of the 4MLinux 24.0 series has been changed to STABLE. Edit your documents with LibreOffice 6.0.0.1 and GNOME Office (AbiWord 3.0.2, GIMP 2.8.22, Gnumeric 1.12.38), share your files using DropBox 43.4.49, surf the Internet with Firefox 58.0.2 and Chromium 64.0.3282.119, stay in touch with your friends via Thunderbird 52.6.0 and Skype for Web, enjoy your music collection with Audacious 3.9, watch your favorite videos with VLC 3.0.0 and MPlayer SVN-r37946, play games powered by Mesa 17.1.4 and WINE 3.1. You can also setup the 4MLinux LAMP Server (Linux 4.14.18, Apache 2.4.29, MariaDB 10.2.12, PHP 5.6.33 and PHP 7.2.2). Perl 5.26.0 and Python 2.7.13 are also available." Further information can be found in the project's release announcement. Download (MD5) (pkglist): 4MLinux-24.0-32bit.iso (1,127MB), 4MServer-24.0-64bit.iso (1,222MB). 4MLinux is a simple Linux distribution for desktops and servers; it uses the lightweight JWM window manager together with the LTS Linux kernel 4.9 and somewhat conservative applications and tools, including the increasingly rare-to-see LILO bootloader. After prolonged testing, the distribution's 23 branch has now been declared "stable": "The status of the 4MLinux 23.0 series has been changed to STABLE. Create your own images with GIMP 2.8.22, edit your documents with LibreOffice 5.4.3 and GNOME Office (AbiWord 3.0.2 with Gnumeric 1.12.35), share your files using DropBox 37.4.29, surf the Internet with Firefox 56.0 and Chromium 61.0.3163.100, stay in touch with your friends via Skype 5.5.0.1 and Thunderbird 52.4.0, enjoy your music collection with Audacious 3.9, watch your favorite videos with MPlayer SVN-r37931 and VLC 2.2.6. 4MLinux 23.0 comes with much improved support for FAAC, GIF, JPEG 2000, Monkey's Audio and Musepack file formats. GNOME Office has been added as a downloadable extension. Full support for SCSI, RAID and LVM devices is now available out of the box. And finally, the biggest change is related to the installation script, which now makes it possible to install 4MLinux on ext2, ext3, ext4, ReiserFS, JFS, XFS, Btrfs and NILFS2 partitions." Here is the brief release announcement. Download (MD5): 4MLinux-23.0.iso (638MB, pkglist). Zbigniew Konojacki has announced the release of 4MLinux 22.0, a new stable version of the project's fast and lightweight mini Linux distribution featuring JWM as the preferred desktop user interface. This version comes with several new features, including the ability to set it up as a LAMP server: "The status of the 4MLinux 22.0 series has been changed to STABLE. Create your documents with LibreOffice 5.4.0 and GIMP 2.8.22, share them using DropBox 28.4.14, surf the Internet with Firefox 54.0 and Chromium 59.0.3071.86, stay in touch with your friends via Skype 5.3.0.1 and Thunderbird 52.2.1, enjoy your music collection with Audacious 3.8.2, watch your favorite videos with MPlayer and VLC 2.2.6, play games powered by Mesa 13.0.4 and Wine 2.10. You can also set up the 4MLinux LAMP Server (Linux 4.9.33, Apache 2.4.25, MariaDB 10.2.6, PHP 5.6.30 and PHP 7.0.15). Perl 5.24.0 and Python 2.7.12 are also available. 4MLinux 22.0 comes with some amazing new features (Skype, FreeCol game, support for the LUKS disk encryption). However, the biggest changes are related to the 4MLinux Server, which is now feature-rich and the lightest and fastest server suite available on the market." Here is the full release announcement. Download (MD5): 4MLinux-22.0.iso (531MB, pkglist). The 4MLinux project has announced the availability of a new release. The new version, 4MLinux 20.0, supports booting in a range of environments and the distribution now works with both legacy BIOS and modern UEFI-enabled computers. The new release also features several package upgrades: "The status of the 4MLinux 20.0 series has been changed to STABLE. Create your documents with LibreOffice 5.2.3 and GIMP 2.8.18, share them using Dropbox 12.4.22, surf the Internet with Firefox 49.0.2 and Chromium 53.0.2785.143, stay in touch with your friends via Skype 4.3.0.37 and Thunderbird 45.4.0, enjoy your music collection with Audacious 3.8 and aTunes 3.1.2, watch your favorite videos with MPlayer SVN-r37881 and VLC 2.2.4, play games with Mesa 12.0.1, WINE 1.9.20 support enabled. You can also setup the 4MLinux LAMP Server (Linux 4.4.27, Apache 2.4.23, MariaDB 10.1.18, and PHP 5.6.27). Perl 5.24.0 and Python 2.7.12 are also available. 4MLinux now supports all possible boot options: BIOS with 32-bit CPU, BIOS with 64-bit CPU, UEFI with 32-bit firmware, and UEFI with 64-bit firmware." Further details can be found in the project's release announcement. Download (MD5): 4MLinux-20.0.iso (490MB, pkglist). The 4MLinux project has announced the release of a new version of the miniature Linux distribution. The new version, 4MLinux 17.0, provides mostly package updates, including Firefox 46 and LibreOffice 5.1.3. "The status of the 4MLinux 17.0 series has been changed to stable. Create your documents with LibreOffice 5.1.3.1 and share them using DropBox 3.18.1, surf the Internet with Firefox 46.0 and Chromium 50.0.2661.75, stay in touch with your friends via Skype 4.3.0.37 and Thunderbird 45.0, enjoy your music collection with Audacious 3.7.2 and aTunes 3.1.2, watch your favorite videos with MPlayer SVN-r37590 and VLC 2.2.2, play games with Xorg 1.18.1/Mesa 11.1.1 support enabled. You can also setup the 4MLinux LAMP Server (Linux 4.4.1, Apache 2.4.20, MariaDB 10.1.13, and PHP 5.6.20). Perl 5.22.1 and Python 2.7.11 are also available." A screen shot and complete list of packages cane be found in the project's release announcement. Download (MD5): 4MLinux-17.0.iso (412MB, pkglist).